The Giant’s Causeway in Northern Ireland is something I’ve long wanted to visit and last week my wish was granted. Geologically, it comprises over 40,000 interlocking basalt columns of different sizes created over 60 million years ago as a result of intense volcanic activity (the temperature needed to create them is between 840ºC and 890ºC). As the molten basalt cool, pseudo-crystals form creating the mainly hexagonal columns we see today. It was granted World Heritage Site status by UNESCO in 1986. When Finn catches sight of Benandonner – luckily, before Benandonner has seen him – he is horrified to see that the Scottish giant is much bigger than he is. His boastful confidence drains away; what is he going to do? He’s built the causeway and there’s now nothing to stop Benandonner from coming to get him. He flees home. Fortunately, Finn has a clever and resourceful wife, Una. She orders Finn to make a large cradle, big enough for himself. He does so. Una tells him to get into it and pretend to be asleep; she covers him with furs and tucks him in. When Benandonner arrives, Una greets him courteously and offers him food and drink. Benandonner, rather nervously, comments on the size of the baby and Una says, yes, he’s a grand wee lad and, one day, he will be as big as his father. Benandonner is convinced that Finn must be truly enormous and beats a hasty retreat. As he flees back to Scotland, he tears up the causeway behind him so that Finn can’t follow. 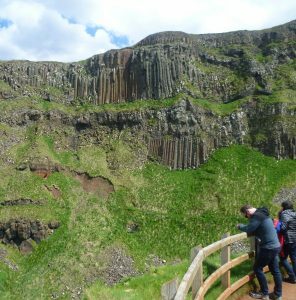 Back in Scotland, the same ancient lava flow of basalt columns re-emerge from the sea in Fingal’s cave on the island of Staffa, in the Inner Hebrides. 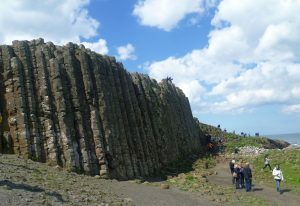 In all the photos I’ve seen of the Giant’s Causeway, it is deserted and the basalt columns are hugely impressive. But this is 2018, it was a Saturday, a beautiful day, and the Giant’s Causeway is now a World Heritage Site. The much-photographed hexagonal columns plunging into the sea were swarming with so many people that they looked like ants crawling all over it. The Giant’s Causeway sticking out into the sea; the hundreds of people swarming all over it are only just visible. 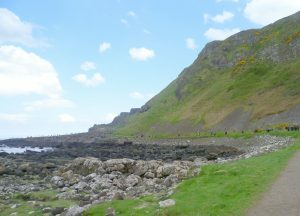 Fortunately, the causeway itself is only one volcanic headland. There are at least three other bays, each with its own volcanic features. 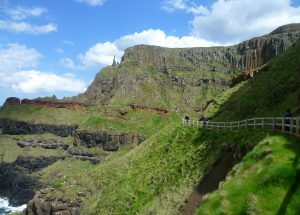 The path winds behind the basalt columns and emerges on the other side. As you walk along the path beside the next bay you see that the columns’ neat hexagonal shapes have been much eroded by the sea. 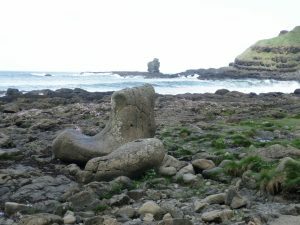 However, there is the strange Giant’s Boot rock formation, where Benandonner dropped a boot in his haste to get back to Scotland. I hadn’t realized that there was much more to see. 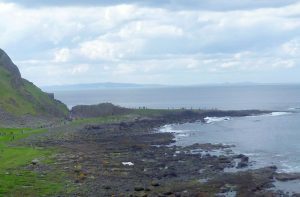 Ahead, in the distance, I could see the next big headland with the Chimney Stacks, another rock formation, rearing into the sky. The path was long and winding and, as we began to climb, you could look down and see rocks and waves below. 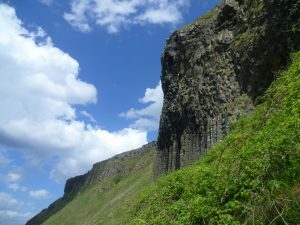 Opposite, well before you turn towards the headland, there are the magnificent Organ Pipes. You can’t photograph them close to as they are almost on the footpath – if you take a step back, it could be your last. The path stops shortly beyond the Organ Pipes where there is a concrete doorway across the path with a note warning you that, beyond this, you go at your own risk as there are frequent rock falls. About fifteen yards away there was a vantage point as the path curved round the corner into the Amphitheatre, an enormous geologic feature. 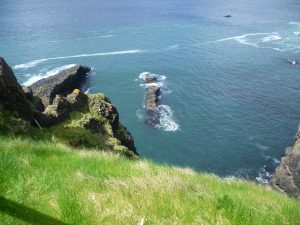 I decided I would risk the short walk to the vantage point; I wanted to see and photograph the Amphitheatre for myself. 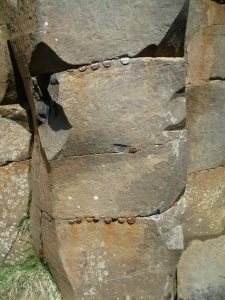 As I went back through the narrow pass behind the basalt columns, I noticed that people had pushed coins into the horizontal cracks and hammered them down to prevent anyone from removing them. For luck, maybe, who knows. If I ever revisit the Giant’s Causeway, I’d like it to be during a winter storm when no-one is around. I’d probably be terrified but it would be a magnificent sight. Well, weren’t you quick with your blog – took a few minutes tracking down but a nice reminder of last week’s trip to Northern Ireland. Thank you, Jillian. I thought I’d start with the Giant’s Causeway as it’s comparatively straightforward. I had some problems with the photos, though. For some reason, the brilliant sunshine turned the pictures dark and it was a struggle to lighten them without turning them wishy-washy.